Almost I’m reaching the final days in Japan, while looking at my calendar it is filled with party schedule. All of them are about farewell to me. When I came to Japan it was tough time creating relations with people here, but once you form your community around then the situation is smooth. For me the final days are precious days. I got many cool people turn to extend their hands for friendship. Unfortunately the day has come, I have to return back. I do love to go back as my kids and family are there in India. Yesterday there was a party (This party is a Japanese party to this Indian) sponsored by team of operations department from the company I’m working in Japan. The chief of the operations is the person whom I always remember as smiley, he has a unique smiling face. I and operations chief and team of five more people from his department were in the party yesterday. These people are the first people outside system department to talk to me in the company. The party was real fun as we were discussing about sports and entertainment. During that time I came to know from one among that they have watched Super Star Rajinikanth’s “Muthu” feature film when it was screened in Japan. 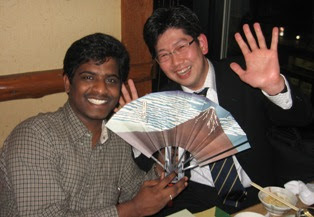 At the end of this party they presented me with a beautiful Japanese “sensu” (the folding fan). Sensu is one of the important cultural symbols and popular tourist souvenir here. In other party that I hosted to my friends from the company in my apartment, there were two guys one of them stays in the Tozai line. On the party day I told them that I would wait in the Baraki Nakayama station to receive them. Mr. Mitadera came sharp at the time fixed, the next person Mr. Ogashira was delayed for few minutes, for our surprise he came in bicycle. 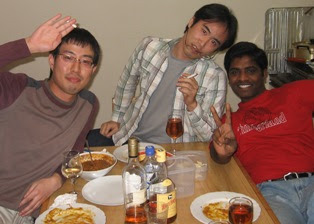 That party was an Indian party to Japanese. I made Chicken curry, Chapati and Green dhal masala as main course. We had few more items on our table on that day. Those guys were really cool and enjoyed our traditional food. 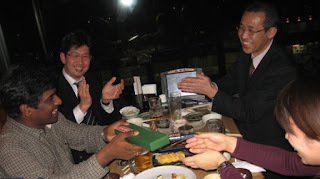 It was Mr. Ogashira who learned how to say taste good in Tamil and pronounced with Japanese accent. 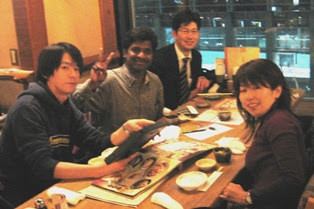 Today my lunch was with an Indian couple in Japan at their apartment. They are my good friends in here; we had our friendship started via. this blog. As the person happen to read this blog turn to me as a friend in later days and today I had lunch with them at their apartment.